Hello friends, sorry, there will be no Alphabet post today. I am madly running around trying to get ready for our vacation. Yep, tomorrow Scott and I am heading out to Maui! We'll be spending the next two weeks on the beach with my Mom and Dad celebrating both Scott's birthday and my parents 40th wedding anniversary. yes, i like pina coladas! Because I will have limited internet opportunities over the next two weeks, I wanted to say bye, and also remind you about a couple of things for The Weekend Cookbook Challenge. Tami from running with tweezers is the host of WCC 14 and her theme is SALAD. Email Tami (runningwithtweezers AT gmail DOT com) a link to your post by March 5. Tami will have the round-up posted a few days after that and will also let you know the host and theme for WCC 15. So goodbye for now! Stay safe and I'll see you soon. * meaning "Until we meet again" in Hawaiian. I am loving all the wonderful guest hosts we've been having for The Weekend Cookbook Challenge and this month is no exception. Tami from running with tweezers is our host this month for #14 and she has chosen salad as the theme. Salad is perfect for this time of year; it (can be) healthy if you're trying to lose weight (like moi), and Spring is finally on it's way (yay!) and we all know Spring and Summer are the best salad months. When Tami told me her theme would be salad, I knew exactly what I was going to make. Finally I'd get to use my No Cook Cookbook! I bought this off the bargain table in the fall, thinking it would be perfect for the summer when our kitchen gets so hot we don't even want to be in there, much less turn on the stove and cook anything. I am loving this book; there are some really inventive dishes in there, and the only concessions to cooking the author uses are to boil water, melt butter, melt chocolate (for some amazing looking desserts! ), and making toast. I've had my eye on this trio of salads recipe since the first time I opened the book. In the words of Ina Garten, The Barefoot Contessa, "How good does that look?" 1 miniature preserved lemon, seeds removed and thinly sliced - I used 1/4 of a regular sized preserved lemon, removed the flesh and chopped it. Halve the tomatos and discard the seeds and pulp. Slice them thinly. Mix them with the lemon, cumin, oil and sugar. Season with salt and pepper. Cut each beetroot into 6 wedges - I did 4, but whatever. Mix with the oil and rosewater and season with salt and pepper. Cut the carrots into small matchsticks - I grated them. Put them in a heatproof bowl and pour boiling water over them. Drain and refresh in cold water. Drain again and dry on a paper towel. Mix with the harissa, oil and salt and pepper. Stir in the lemon juice just before serving. These were all so good, especially the tomato and lemon. Other than pre-cooking the beets they all came together in minutes. I can't wait for my kitchen to heat up so I can try some more of these recipes! Get your post about Salad for the Weekend Cookbook Challenge over to Tami by March 5! Email her at runningwithtweezers at gmail dot com. Hey it's Feb 20 and my quick batch of preserved lemons was ready on the 15th. Last night I made my salad for WCC 14 and used preserved lemons for the first time. The traditional method is looking a little cloudy. Can anyone with preserved lemon experience tell me if this is normal? It's making Scott nervous. Here's some pieces from the bag, which I've now moved to the fridge. I rinsed them with cold water then scraped out the flesh of the lemon. I diced up the lemon (not pictured) and tried some. SALTY! I was shocked at how salty they were after I had rinsed them, but they have been sitting in salt for 2 weeks, so it shouldn't be that shocking, should it. But once I added it to the salad, yum. Can't wait to try some other recipes out soon. Come back tomorrow for my WCC post featuring the lemons! I've got your attention now, don't I? As I mentioned yesterday we tried two new recipes last night when we got home from the hockey game. (Peabody - the Hitmen won 4-3, but the Blazers played so well it was surprising they lost.) I'm not really a Rachel Ray person, but I'd caught the last few minutes of an episode of 30 Minute Meals a few days ago and one dish was stuck in my mind. When Scott said he wanted chicken wings this weekend, I asked him if he'd mind having Buffalo Popcorn Chicken Bites instead. served with fresh veggies to combat the batter and grease...don't think it worked. 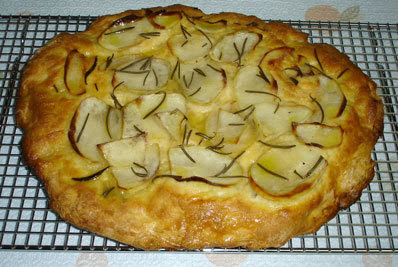 I've recently discovered the reviews that come with the recipes on foodtv.com so I read them first. While most people liked the chicken, there were a lot of comments about the batter being too thick and not being able to taste the hot sauce. We kept that in mind and both comments turned out to be true. I added about another 3/4 to 1 cup of water to the batter (there was also way too much batter made) to get it to a consistency we were happy with, and, I am not exaggerating, we used 4 times the amount of hot sauce AND the chicken was still only mildly spicy. But, these were delicious and I would make them again. 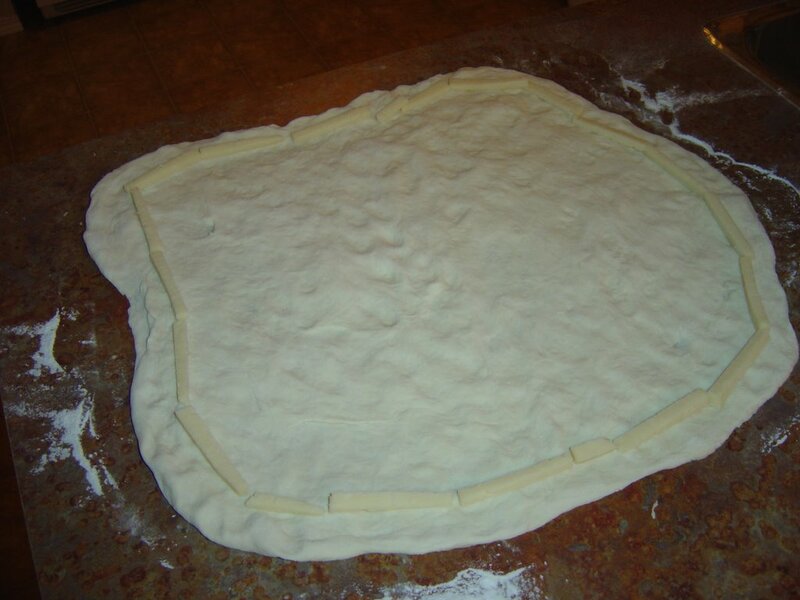 Not soon mind you; that's a lot of dough and oil. Saturday I was going through some papers and I came across a recipe my Mom gave me about 2 years ago for a drink that was served at a party they attended. Mix the Limeade concentrate and Tequila together in a large jug. Add the Corona and stir well. Serve over ice in glasses with salted rims and lime wedges. These are so good, but lethal! Do not serve these if anyone has to drive or get up early the next day. As I write this, Scott is lying on the couch with his head in his hands. Scott and I aren't really big into Valentines Day, but we always have a nice dinner. This year we did the ole meat and potatos bit. I love Parisienne Potatos, so I went out and bought myself a melon baller. They're sort of a waste of potato, but in hindsight I could have done something with the remains. I tossed the balls with olive oil, minced garlic and paprika and then roasted them for about 40 minutes. I had bought some zuchinni the day before but hadn't thought of what to do with it. Lucky for me, Mary came to my rescue, just like she did at Christmas with a great recipe for zuchinni with garlic and parmesan. I made Steak Diane for the first time and it was a success! I think the sauce was a teensey bit too salty, but Scott said it wasn't. Isn't he sweet. Let the steaks sit out at room temperature for an hour or so to warm up. Press the pepper into both sides of the steak (use as little or as much pepper as you like). Heat the oil in a pan over medium-high heat until very hot. Add the steaks and cook, turning once, until they are done to your liking. Alternatively, you can brown the steaks on top of the stove, then finish cooking them in the oven. When the steaks are done, remove them to a plate. Cover with foil and keep warm while you make the sauce. Carefully pour the brandy into the pan and cook, stirring up all the brown bits on the bottom until the brandy is reduced by half. Add the beef broth and simmer for 4 or 5 minutes. Drop in the butter and stir until melted. Add the mustard and cream and simmer gently until the sauce is thick. Taste and season with salt and pepper if needed. Place the steaks on your plates and top with the sauce, any maybe a bit extra for your potatos. Serve straight away. In other news I'm happy to announce that I've won a Poppy Award for Best Recipe Blog! Thanks to Poppy at Poppy Cedes for the honor. Edited to add - thanks for all your emails! I'm happy to say I've got the award up in the side bar now. It's a long weekend this weekend in Alberta! This afternoon we're going to see a hockey game - the Hitmen vs the Kamloops Blazers. I'm thinking of making something new for dinner tonight and maybe even some kind of drink, since we don't have to get up early tomorrow. Not too many drinks though, we have a crazy week ahead. P is for Pub Grub. What: That would be the food that is served at pubs. Where and When: The word "pub" comes from the term "Public House" which is what Pubs were called in the Victorian era. Pubs actually originated in the Roman times, 2000 years ago. Why: Because it tastes good, and sometimes sitting with your friends, drinking a pint and eating some nibbles is a good way to pass an evening. A pint of Ricketts for Scott and a pint of Strongbow for me. Beautiful gooey full of fat Guinness and Cheddar Soup. Sadly my phone battery died before I could take a picture of our potato nachos - have any of you had these? They cut waffle fries, cook them, and then use them like tortilla chips in nachos, covered with cheese, tomatos and onions and served with sour cream and salsa. They were gooooood. On another visit to another pub we shared this platter. Natchos, wings, skins, little fried pork things. Ohhhh, the grease. Click here for my recipe for potato skins. After potato skins my favorite pub snacks are dips. 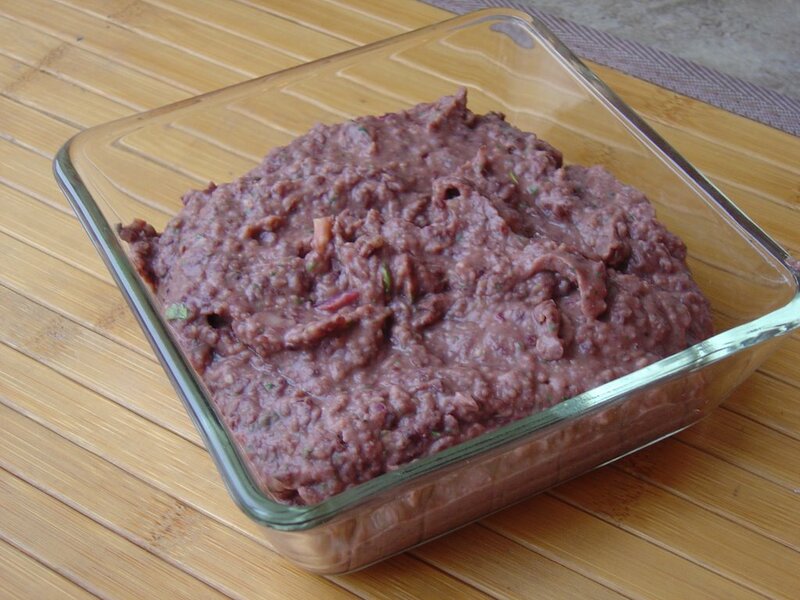 Place the beans through lime juice into a food processor and whiz until blended but still a teeney bit chunky. Taste and season with salt and pepper if needed. If you have leftover bean dip, it is sooo good wrapped in a tortilla, or plonked on some scrambled eggs. Drain the artichokes and finely chop them. Mix all the ingredients together and season with salt and pepper if needed. Pour into a small dish and bake at 400' for 15 minutes until hot. I am very proud of this soup. I made it for Scott - he loves canned tomatos. He loves canned tomatos so much that every time I open a can of them to cook with he points behind me and yells "What's that?!?!". Then I dutifully turn and peer around while he pulls tomatos out of the can and eats them over the sink. Ah husbands. What are you gonna do? While I love tomatos too, unlike Scott I am not a fan of tomato soup. To be honest, the only encounter I've ever had with tomato soup was Campbells, and that was enough to put me off for good. But it's been cold and snowy here and I wanted to make a nice warm comforting soup. I decided to try to make my own after coming across a can of Campbells that Scott snuck into the pantry. The nerve! Heat the oil in a large pot over medium heat. Add the onion and garlic and cook until nice and soft and just starting to brown. Add the stock, tomatos, oregano and basil. Bring to a simmer, then return heat to medium or medium-low and simmer gently, uncovered, for 30 minutes. Stir occasionally. Remove the pot from the heat. Transfer the soup in batches to a food mill and press through. (You can puree the soup in a blender or food processor if you wish, but I really wanted a smooth soup with no bits. 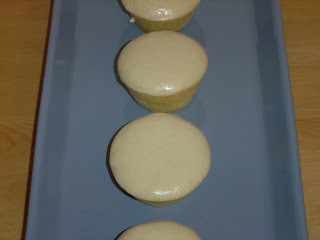 )(OK, I really just wanted to try out the food mill I bought 3 months ago and hadn't used yet.) Return to the pot and add the cream to your taste. Re-warm, do not boil. Season with salt and pepper and serve. You know how some groups say that fast food and junk food commercials are targeted at children? Add husbands to that group. For the past few weeks Pizza Hut has been running tons of commercials for their Stuffed Crust Pizza. And Scott has been watching and drooling. "I've never had a stuffed crust pizza before." He said sadly the other night. Well for the love of all things stuffed I thought we'd better change that! 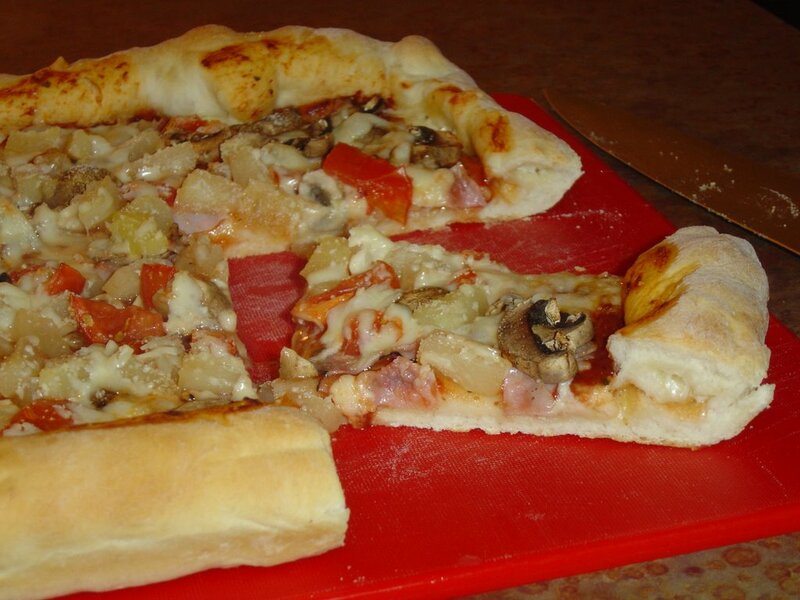 So last night we made our very own stuffed crust pizza. And it turned out pretty darn good. I used our bread maker's recipe for pizza dough and then patted the dough out into a larger pizza than usual. 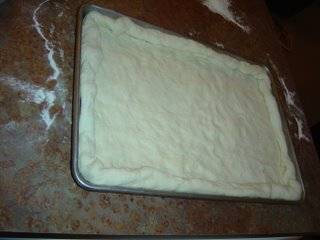 I cut sticks of mozzarella and placed them all around the edge of the crust. I rolled the dough over the cheese twice to (hopefully) keep all the melty cheese on the inside. Then we plopped it in the pan. We covered the dough with deliciously garlicky pizza sauce, ham, pineapple, tomatos and mushrooms, some more mozza, and then into the oven it went at 425' for 25 minutes. And when it came out? It was very tasty. One section of the crust un-rolled during cooking and let some cheese out, but for the most part it worked very well. The picture's not the greatest, but if you squint, you can see the cheese in the crust. I'm sure we'll be having this again and again if Scott gets his way, and really it wasn't much more work than making a regular pizza. I wonder how different cheeses would be in the crust? Maybe some Gouda, or Goats cheese? Yum. I've been interested in Preserved Lemons since the first time I had a tagine at The Sultan's Tent restaurant - a wonderful Moroccan restaurant - here in Calgary. Well, interested might not be quite the right word as that first meal was ages ago and only now am I making them for the first time. Preserved Lemons are a staple in Moroccan cuisine, especially in Tagines. The lemon pieces become very soft and when you are ready to use them you rinse them, scrape away and discard the flesh, and cut the rind into strips or a small dice. It is ridiculously easy to make Preserved Lemons yourself. You only need lemons, salt, and a jar. The only drawback to making your own - the lemons must sit for 3-4 weeks before they are ready. For my salad recipe that is too far away for me so I'm making two batches of lemons. One quick and one traditional. Below is how I've started my two batches of Preserved Lemons. All this was started on the evening of Thursday February 8. Since the rind will be eaten, I've washed these very very well and dried them. Then I cut off both ends of each lemon, and cut each lemon into eight pieces. I put the wedges into a smallish zip-lock bag and put the bag in the freezer. The next morning before work I took the bag out of the freezer and added 4 tb of coarse salt. I smooshed out the air, closed up the bag and massaged it with my hands to mix the lemons and salt together. Then I labelled it and laid it on a plate on my kitchen counter. Every day I squish the bag with my hands to mix everything up. They will be ready in a week (I've got them marked to use on Feb 15). Batch Two is the traditional and more time consuming method. Again, we have two very well washed and dried lemons, each lemon cut into eighths. I put the lemons in a bowl and poured in 1/2 cup of coarse salt. I tossed everything together with my hands, and let it all sit while I washed my jar and lid, and then "sterilized" them under boiling water. I transferred the whole mess to the jar that I drained and dried, then filled the jar to the top with extra lemon juice. I put the lid on tightly and shook for about a minute. This jar sits on my counter and I shake it every day. It will be ready to use on March 8. It's sort of exciting (in a sad, sad way) to watch the lemons start to change. It's pretty easy to see and feel the changes in the quick batch - the color is changing slightly, there's lots of juice and the peel is so soft. I guess I'd better start looking for an easy tagine recipe so I can use up some of these lemons! Anyone got any suggestions for me? I'll update you after Feb 15 and the beginning of March with the outcome of the lemons! 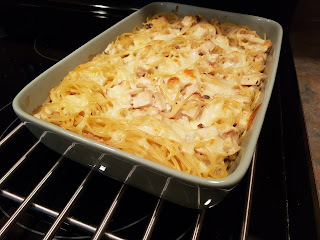 Stephanie at Dispensing Happiness has picked a spot-on challenge for Blog Party 19 - Comfort Food. These past few weeks - for me at least - have been filled with nothing but snow, cold temperatures, and being under the weather. What is a more perfect time to fix up some comfort food? We start with our beverage, a new favorite of mine, Pineapple juice and soda water. Nice and sweet and fizzy without any added sugar or caffeine or alcohol. The only problem for me is actually finding pineapple juice in Calgary! What is up with that? Our savory appetizer tonight are Mini Sloppy Joes. I cut some slices of a nice cheese bread into small cubes and topped half of them with my leftover warmed up vegetarian sloppy joe filling and covered them with the other mini bread slices. For dessert, what could be more comforting than cupcakes? The recipe for these Lemon Gem Cupcakes comes from Vegan with a Vengeance. They were so fabulous. I was the only one who knew they were vegan. They were gobbled up in about 2 seconds. Comforting indeed! What: An underground bulb related to the lily. Classified as a vegetable. When: Onions and their kin date back to the Egyptian age. Egyptians worshipped the onion, believing it symbolized eternal life. 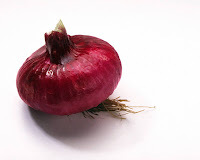 Onions have also always been a staple food in Indian cuisine. Where: Onions are easy to grow anywhere there is sun. Plant in December for onions in May to June. Why: Onions are an excellent source of Vitamin C and fibre. They are fat, sodium and cholesterol free. Onions are available for purchase fresh, frozen, canned, pickled, freeze dried and powdered. Also in the onion family: leeks, chives, garlic and shallots. Onions contain sulfuric compounds that cause watering of the eyes when an onion is cut. There are many wives tales to remedy the situation - including freezing the onion, wearing goggles and holding a spoon in your mouth. Uncover, raise heat to moderate, and stir in the salt and sugar. Cook for 30 to 40 minutes stirring frequently, until the onions have turned a deep even golden brown. We vary the dressing we use on this, but our current favorite is President's Choice Blue Cheese Vinaigrette. Toss the spinach and mushrooms together. Sprinkle with cheese and top with the onions. Drizzle with dressing of your choice. Preheat oven to 350'. Separate the onion into rings on a parchment covered baking sheet. Mix together the honey and olive oil and season with salt and pepper. Pour over the onions and toss together. Bake for 15 minutes, then stir and bake for another 10 or 15 minutes until slightly brown and crisp. Whisk the eggs, cheese, a bit of salt and pepper, and 2 tb water. Set aside. In a medium pan heat the oil over medium high heat. Add the peppers and leeks and cook for a few minutes. Add the garlic and cook until the peppers are soft and the leeks are starting to color. Pour in the eggs. Cover and lower the heat to medium, let cook until set. Place under the broiler for a few minutes to finish setting the top if needed. Serves 2 to 4, depending on how hungry your husband is. Did you know? The word ONION comes from the Latin word UNUS meaning oneness or unity. I know! Beans again. In my defense I haven't been well this week and this is a simple soup that doesn't require a lot of work. This weeks soup for Soup or Stew Thursday at Cookin' With Cyndi is Black Bean Soup with Coconut Rice from Frugal Cuisine. So good. This was delicious and filling. The coconut rice is such a perfect accompaniment, I can't imagine eating the soup solo. Again this week I wanted to keep the soup vegetarian, so I opted for Pepper's suggestion to add a chipolte pepper for some extra flavor. I did the same thing as for my other Black Bean Soup - I simmered a dried chipolte pepper in the soup until it was time to eat, then pulled it out. 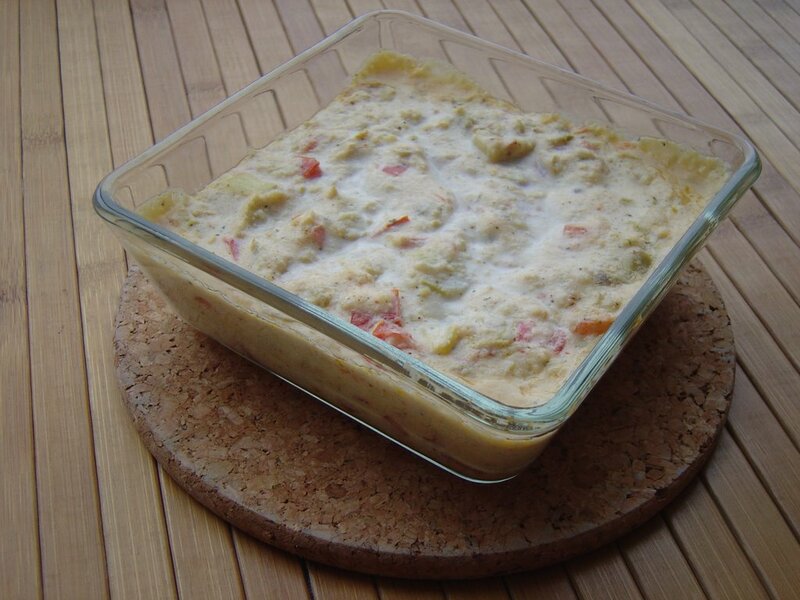 Go here to see Pepper's recipe at Frugal Cuisine. Weekend Cookbook Challenge 13 - The Round-up. Helllllloooooo! The round up for Weekend Cookbook Challenge 13 is up! Go HERE to see. When I was growing up my parents were fairly strict about what I ate. While my best friend across the street ate Fruit Loops for breakfast, I was having sugar free granola. Potato chips and ice cream rarely made appearances in our house. I was a teenager before I had a glass of pop. I was 20 the first time I had Cheese Whiz. I've never had a Pop-Tart. And until last week, I'd never had a sloppy joe sandwich. It's not like evil family members and friends were holding sloppy joes just out of my reach and taunting me; the older I got, the less appeal they held for me. Ground beef and tomato sauce on a bun? Meh. But last week I came across a recipe for a vegetarian version of a sloppy joe that I just knew I had to try. So I tweaked and adjusted and came up with a pretty damn good joe. These are sweet and a bit spicy and full of beans. There is tofu in there too, but unless you are the one making them, no one would know. recipe adapted from The Rebar Modern Food Cookbook. About 1/2 hour before you start cooking, place the tofu on a plate. Lay another plate on top of the tofu and place some kind of weight (large food can or heavy pot or pan) on top of the plate. Let sit on the counter. Start the sauce. Heat the oil in a medium pot. Add the onion and cook for a couple of minutes. Add the garlic, jalapeno and pepper. Cook for 5 minutes then add the cumin, chile powder, five spice powder and stir for 2 more minutes. Add the kidney beans thru oregano. Bring to a gentle simmer and cook, uncovered for 30 minutes. Make sure you stir from time to time. While the sauce is simmering preheat the oven to 350'. Drain off all the liquid that has come out of the tofu and crumble up the tofu into small pieces. Sprinkle onto a baking sheet and bake the tofu for 15 minutes. After the sauce has simmered for 30 minutes stir in the tofu. Taste and season with more salt, pepper and hot sauce if needed. When the tofu is heated through, spoon onto the toasted buns and serve right away. What: Made from flour and water (with eggs, oil and other ingredients added for different types of noodles) noodles come in all shapes (long, short, flat, round, hollow etc). When: Historians believe that the first form of noodles originated in Central Asia, possibly as early as 1000 B.C..
Where: Many cultures have their own form of noodles. Germany has Spaetzle, Poland has Pierogi, Japan has Udon and Soba. Why: Noodles can be a good source of fibre and carbohydrates. If the dough contains eggs or oil, or if the noodles are deep fried they are not as good. The sauce or topping you use will also add calories and fat to the dish. Noodles are available fresh (if you are lucky), dried and frozen. The most common legend about the origin of noodles is that Marco Polo brought them to Italy from China. My Nana was as far as I know, the originator of this recipe. If they ever had a real name it has been long forgotten. My Nana used to make these every Christmas. Now if my Mom doesn't make them I do, for me and my Dad. I have altered them slightly from the original. In a double boiler melt the chocolate chips and butterscotch chips. When they are melted and smooth stir in the peanuts and chow mien noodles. Stir well to coat, being careful not to smoosh the noodles too much. Drop by big spoonfuls onto parchment or wax paper and let cool. I whipped this up one night when there wasn't much in the cupboards. Even when the food supply is low, we always have the basic ingredients for a dish like this on hand. Bring a large pot of water to a boil; salt and add pasta. Cook until al dente, drain and keep warm. Meanwhile heat a large pan over medium heat and add oil and garlic. Cook stirring often for a few minutes until garlic is just starting to color. Add tomatos and chile flakes and simmer for 5 or 10 minutes. Add the parsley, season with salt and pepper and simmer a couple of minutes more. Toss with the cooked pasta, sprinkle with parmesan and serve. I love love love spinach noodles. It's my very favorite kind. Have you ever had fresh spinach pasta? Oooh. 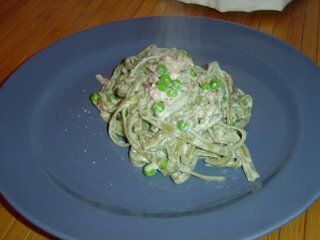 Here's a dish full of the three P's - Pasta, Peas and Prosciutto. It's not an every day dinner, what with all the cheese and cream, but it would be perfect for a special dinner for two. And, it hardly takes any time at all. Spinach Fettucine with Peas and Prosciutto. Cook the pasta in a large pot of boiling salted water until al dente. Drain and return to the pot. While the pasta is cooking, heat a saute pan over medium high heat and add the olive oil and butter. When the butter has melted add the onion and cook for 2 minutes, just to soften but not brown. Add the prosciutto and cook, stirring for another minute. Add the cream and peas and simmer gently for 4 or 5 minutes, until the sauce has thickened and is warmed through. Stir in the cheese and season with salt and pepper. You will not need much salt as the ham and cheese are salty. Pour over the drained pasta and toss well. Gah! I'm sick again, if you can believe it. I'm off to make a cup of tea and find a lozenge. Don't forget that Monday Febuary 5 is the last day to email me your post for Weekend Cookbook Challenge 13. So cook something up this weekend and send it in!! !